Flickr. Creative commons.In 1976, Ulrike Meinhof, a founder of the West German Red Army Faction, was found hanged in her prison cell. Guards secretly removed her brain, hoping that scientists would discover some neuropathology which explained her attraction to extreme left militarism. This was the only way the state could comprehend her actions—the possibility that Meinhof’s radicalisation was driven by contradictions immanent to West German society itself was too uncomfortable and challenging a proposition to consider. Today, Islamist terrorism is treated the same way: a self-generating, evil ideology abstracted from any context. But if the massacre of Charlie Hebdo journalists and connected killings were tragic, brutal and unjustifiable, our understanding of, and reaction to, the attack—and to Islamist extremism more broadly—urgently requires rethinking. The most succinct formulation of the mainstream narrative was given by the front page of the French sports daily L’Equipe on the day following the attack: the headline simply read “Freedom 0-12 Barbarity”. France’s President, Francoise Hollande, ran with the theme, reassuring the nation that “freedom will always be stronger than barbarity. France has always known how to defeat its enemies when it has known how to defend its values”. These “values”, the BBC had no hesitation in stating, are those of “rational, post-Enlightenment Europe” - an apparently peace-loving and progressive world view, to which the monstrous and mindless brutality of the attackers is said to be utterly incomprehensible. This grand, civilisational framing of events—in which “our” free, democratic and open society is diametrically opposed to “their” barbaric, violent and primitive mentality—is, of course, nonsense. Like all conflicts, this one emerges from a certain historical, social and political context: assigning exclusive explanatory power to an “evil” and “alien” ideology is intellectually lazy and analytically useless, substituting the surface of the conflict for its substance. While Islamist terrorism may express itself in religious and cultural terms, its origin is political – which is to say that it only takes place within current power relations and material conditions, never outside them. In the production of these conditions, the major actors are the very same western states which now with hypocrisy and hubris claim that their “values” are under attack by a demonic and incomprehensible foe. The point has been made and ignored many times before, yet bears repeating: almost every single perpetrator of Islamist terrorism in western countries has explicitly cited western foreign policy as their major motivation. While religious fundamentalism - or any other extremist, militant ideology—certainly provides a language through which to express such opposition, denial of this basic political fact is either disingenuous or deluded. An explanation is not an excuse and recognising an act as political is not the same as endorsing its politics. Both Tsarnaev and Adebolajo unambiguously saw themselves as answering violence with violence. In a certain important sense, they understood their mission as confronting the societies of the west with the same senseless horror that the west regularly visits upon the “Third World”. As such, the abhorrent morality of the acts is itself part of an ethical message that western societies must have the courage to recognise—not in order to absolve the immediate culprits, but to confront the naked horror of a relationship of violence of which our own states are the pre-eminent producers. In bringing this violence beyond any recognised theatre of war, the Islamist “Jihad” follows the same logic as the west’s own “Crusade”—as George W Bush first described the disastrous and ongoing “War on Terror”. If Afghanistan, Iraq and Libya represent highly questionable but nonetheless largely conventional imperialist conflicts, the US-led drone strikes in Pakistan, Somalia and Yemen claim a far more ambitious mandate: the right to strike anyone, anywhere, at any time. None of these places are official war zones; none of the people killed are tried in courts of law; none of the operations are subject to the (admittedly minimal) democratic and constitutional oversight of Congress. The drone strikes—themselves of highly dubious legality—have so far caused around five thousand deaths, with “combatants” simply defined as any adult male in the vicinity. These acts of conventional and unconventional warfare are accompanied by widespread and horrific torture and the west’s own terrorist death squads. Last seen in Iraq and Afghanistan under the control of JSOC, Blackwater Worldwide or local hired mercenaries, these teams adopted tactics first developed and deployed during the late Cold War, when the humiliation of Vietnam prompted the United States to switch from direct engagement to covert, proxy wars. As Mahmood Mamdani shows in his devastating book, Good Muslim, Bad Muslim, this explicitly targeted civilian populations in order to erode support for “communist” (that is, anti-imperialist) regimes and insurgencies. The most concerted application of western proxy terrorism was in Afghanistan – the mujahideen were not only founded and funded by the United States, but learned their tactics directly from their imperialist paymasters. Indeed, as scholars such as Rahul Rao and Domenico Losurdo have demonstrated, the great humanistic values of “rational, post-Enlightenment Europe” have always provided the legitimating ideological superstructure for the brute violence of empire. Aime Cesaire spoke a truth few westerners want to hear even today when he stated that, in conducting the Holocaust, Hitler merely “applied to Europe the colonial practices that had previously been applied only to the Arabs of Algeria, the coolies of India and the Negroes of Africa”. Western civilisation, ever since it became conscious of itself as such, has always had “bloody borders”, to borrow Huntington’s phrase; those on the wrong side of them have only ever appeared to the western gaze as what Giorgio Agamben calls homo sacer: “human life...included in the juridical order solely in the form of its exclusion (that is, of its capacity to be killed)”. Most white Euro-Americans may erroneously consider the crimes of imperialism to be a closed chapter in history, or at most express a sporadic and largely abstract opposition. But for millions of Muslims living in western societies with family and friends in the countries targeted by the “War on Terror”, it remains a daily reality impossible to ignore. In the globalised world of the twenty-first century, the internationalised, industrialised and institutionalised violence of this politics abroad engenders an inevitable blowback in the sporadic yet highly spectacular violence of terror at home: for the first time in history, foreign militarism has a domestic price claimed through equivalent means, if not to a remotely equivalent scale. We are involved not in a “clash of values”, even less a “clash of civilisations”: the Charlie Hebdo massacre was merely the latest round in what Gilbert Achcar has termed “the clash of barbarisms”, within which western societies, by any objective measure, suffer by far the lesser trauma. Race has no genetic or biological basis. It is a social construct and all racisms work by attaching social prejudices to a particular group, for whom skin colour is at most an external identity marker. As such, although it is true that “Islam is not a race”, Islamophobia is as racist as anti-Semitism—indeed, the two forms of hatred share a common genealogy, with Jews and Muslims historically demonised side-by-side and in similar terms in western legal, cultural and politico-philosophical discourse. The importance to European self-identity of constructing a negative image of Islam and Muslims has been extensively documented, notably by Edward Said in Orientalism and Covering Islam and more recently by Arshin Adib-Moghaddam in A Metahistory of the Clash of Civilisations: “Us” and “Them” beyond Orientalism. It is only through such a racialised lens that the violence of western states can be presented as rational and legitimate while the violence of Islamist terrorists is perceived as incomprehensible and pathological. And the same, often sublimated, logic of white supremacism augments the large-scale militarised violence of empire with an everyday violence against Muslims within western societies themselves. Following the Charlie Hebdo massacre, mosques have already been attacked across Europe. The Daily Mail employs an entirely mainstream vocabulary when it describes this violence as “revenge” and “retaliation”; a Telegraph headline similarly states that the Paris shootings “led to” the attacks on mosques. The violence of white Europeans is thus contextualised as a symptom of Islamist terrorism, while that terrorism itself is systematically decontextualised from the violence of the west. However, these are dangerous and disingenuous euphemisms: throwing grenades at Islamic places of worship which have no connection to the gunmen other than the coincidence of sharing a faith is neither “revenge” nor “retaliation”, nor is it “caused” by the attack on Charlie Hebdo. It is racist and it is caused by racism. And it is in itself, by any objective definition, an act of terrorism undeserving of any other name – which Muslim communities in the west have been suffering on an almost daily basis over recent years. The latest Islamophobic attacks continue a long-standing history of domestic racialised violence within France against the country’s former colonial subjects, most horrifically represented by the French police’s 1961 massacre of Algerian protestors in Paris. The relative lack of sympathy Muslim victims continue to evoke in Western eyes was also made clear by Prime Minister Manuel Valls' announcement that "synagogues, Jewish schools, but also mosques will be protected because in the past few days there have been a number of attacks against mosques". Why the need to explain the decision of the French state to protect its Muslim citizens, or prefigure it with a "but"? To whom and to which idea of French society does this subtle othering of Muslims appeal? These attacks are merely the most overt and offensive manifestation of an anti-Muslim racism which is pervasive within western societies. In addition to such openly thuggish forms, this also comes in bigoted and liberal varieties. The former is represented by the likes of Rupert Murdoch, who tweeted that “until they [all Muslims] recognise and destroy their growing jihadist cancer they must be held responsible”. The racism of liberals is ostensibly more progressive, yet still demands that “good Muslims” distinguish themselves from “bad Muslims” by condemning the attacks. While Muslims certainly have the right to publicly denounce those who kill in the name of their faith, the racism of the liberal demand can be seen firstly in the absence of the same invitation to criticise western violence and, secondly, in the fact that this demand is never made of other groups. Jewish “community leaders” are never heckled by the mainstream media to oppose the violence of Israel; white people react with indignation when they are asked to take responsibility for slavery, colonialism and imperialism – despite the fact that, unlike Muslims vis-à-vis Islamist terrorism, white people continue to benefit from the socio-cultural, economic and political privileges established and maintained by such racist power structures. The thuggish, bigoted and liberal variants of Islamophobia also share the common assumption that Islamist terrorism is a self-contained phenomenon autochthonous to the Muslim community. This act of displacement, in denying that western society as a whole bears any responsibility, neglects the severe economic marginalisation and widespread institutionalised racism suffered by Muslims living in the west. France presents a particularly striking case of the latter: despite making up only 12% of the population, Muslims account for between 60-70% of prisoners in French jails—a statistic which should be every bit as shocking as similar figures for African Americans in the United States. The utter failure of French society to confront its racist present and genocidal imperialist past is further demonstrated by the law requiring French schools to focus on “the positive role of colonialism” in North Africa – the equivalent to American schools teaching black children about the “positive role” of slavery, or German ones teaching Jewish students about the “positive role” of eugenics. The message sent to migrants and the children of migrants from France’s former colonies is clear: your historical experience does not matter; your social status is insignificant; your only options within French national identity are assimilation or silence. The issue of Islamophobia brings us to the now (in)famous cartoons and what they represent. The right of Charlie Hebdo to publish such images should be defended; so should the right to call out their racism. Satire can be a powerful means of challenging authority, but when it is disproportionately directed against an already marginalised and demonised minority, it becomes merely another tool for maintaining racial hierarchies. This is no justification for the attack; however, as articulated by Tariq Ramadan, the fact that a near bankrupt magazine decided that the best way to increase profits was to repeatedly publish Islamophobic cartoons – and Islamophobic some of them certainly were, often without any “satirical” content whatsoever – indicates the level of anti-Muslim racism within French society at large. The right of freedom of speech is indeed fundamental to any democratic society, but its application is currently highly selective. The most prescient parallels to be drawn with the Charlie Hebdo attacks are perhaps the 1999 Nato bombing of Serbian TV and radio stations and the more recent US bombing of al-Jazeera offices during the 2003 invasion of Iraq. These journalists, it seems, were not free to produce images offensive to western narratives of the conflicts: they, like those at Charlie Hebdo, had to be eliminated. There are also countless instances in which free speech has been denied to Muslims living in western societies. In this regard, we can contrast the official support for the marches in solidarity with Charlie Hebdo to the blanket ban imposed by the French state on Arab-led protests expressing an equivalent show of unity and outrage during Israel’s latest massacre of Palestinian life. 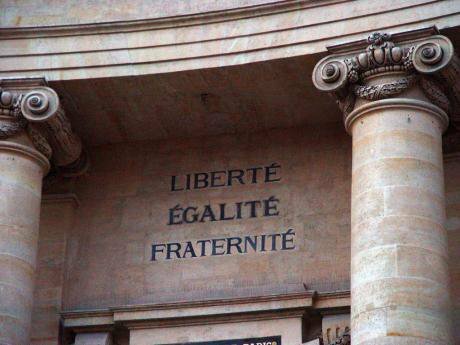 More broadly, the last decade has seen a transformation of France’s interpretation of secularism from its origin as a principle of societal pluralism guaranteed by state neutrality into a militant dogma of state-enforced public conformity. The “burqa ban” is the most prominent and problematic marker of this shift. Such measures seek to erase Muslims as Muslims from the public sphere, their very appearance framed as a threat to the nation. Islam can only be tolerated in French public life when it is being ridiculed and vilified; meanwhile the strictly secular French state continues to hold official ceremonies in Notre Dame Cathedral. Such overtly anti-democratic laws are embedded within a much broader and more extensive surveillance regime, in which Muslims’ non-criminal behaviour is subject, Minority Report style, to hyper-policing. In the UK, this has reached absurd levels: nursery teachers are asked to monitor Muslim toddlers, lest three- and four-year-olds exhibit signs of becoming potential future terrorists. Muslims experience the same surveillance throughout school and university, while those exhibiting “suspect” behaviour such as criticising western foreign policy risk being targeted by government informants, incarcerated, or manipulated into committing terrorist acts by agent provocateurs. Many of the so-called “foiled plots” in the US over recent years were in fact the work of undercover FBI agents, who provided the initial suggestion, the plan, the funding and the weapons for their targets to act – often offering extremely poor and vulnerable people, including in at least one instance an individual with a history of mental illness, tens of thousands of dollars to participate in attacks. Arun Kundnani documents and demolishes this regime in his important work, The Muslims are Coming!. Through countless interviews, Kundnani shows that many Muslims now feel afraid to discuss politics in public, in case they are branded “extremists” and attract the attention of counter-terrorism police. He also convincingly argues that it is precisely this erosion of the democratic norm of free speech under the twenty-first century surveillance state that prevents the emergence of a radical but non-violent movement amongst western Muslims capable of challenging their subaltern social status and voicing opposition to imperialist violence. Also relevant is that fact that, like the attackers in London, Madrid and Boston, those in Paris were known to the police and details of their plans were held on official databases. But with officials overwhelmed by the vast quantities of information gathered secretly on completely innocent people for non-criminal activities, it simply got lost in the ocean. The tactic of universal surveillance thus paradoxically makes real threats less visible. Of course, none of the multiple forms of violence suffered by Muslims at western hands directly “justify” the recent attacks in Paris, nor led to them as such through any mechanistic chain of cause and effect. But the fact remains that millions of Muslims, though often citizens of western states, do not experience those states as liberal democracies. Abroad, they act as aggressive imperialist powers with zero regard for their much-vaunted “values”; at home, they systematically marginalise Muslims from civic life and deny them any public forum through which to denounce imperialist crimes. It is precisely within such increasingly authoritarian conditions that underground, extremist movements find an audience. Insofar as ideologies provide a way of “making sense” of the world, a vocabulary through which to express oneself politically and a mode of action through which to change reality, those of certain strands of militant Islamism are contributing factors to attacks such as the recent shootings in Paris. But no ideology can gain ground without corresponding material conditions which confirm its truth to potential followers. It is thus not surprising that the Paris gunmen, like the London and Madrid bombers, were born in the west and had previously seemed well integrated. Contrary to the demagoguery of the likes of Nigel Farage and Marine Le Pen, Islamist terrorists rarely arrive here already radicalised. That process usually occurs only through the experience of living within western society, of seeing its contradictions, inequalities and hypocrisies, both domestic and international. Without such a basis in mundane reality, even the most fervent ideology is—quite literally—meaningless. Liberté, Egalité, Fraternité: this was the headline with which the Telegraph accompanied its front-page picture of the march in Paris. The commonly-made reference to the founding principles of La Republique contains within it a condensation of all the contradictions surrounding the narration of recent events. At its most progressive and emancipatory, the vision of the French Revolution had a universal potential, equally applicable to all people, at all times, in all places. As best documented in CLR James’ The Black Jacobins, the impeccable logic of dialectical irony meant that this potential was most fully realised when the colonial subjects of the French Empire turned the metropole’s own slogans against it in revolutionary struggle. At its most reactionary and repressive converse, the French Revolution’s manifesto became a narrow parochial one, applied only to those with wealth and white skin and used to obscure their privilege and power. Which version of the vision does the phrase je suis Charlie evoke? If we truly believe that we are indeed “all Charlie”, are we not compelled to offer the same solidarity to all the victims of the “War on Terror”? Are we not also Shakar Aamer, imprisoned for thirteen years in Guantanamo without trial? Are we not Moazzam Begg, recently released after years in the same totalitarian facility, whose only “crime” was attempting to publicise evidence of western governments’ complicity in torture? Are we not the victims of that torture, the children slaughtered in drone strikes, the hundreds of thousands killed in an illegal and pointless war in Iraq? Are we not the dozens of Muslims butchered by white fascists since 2001 across the western world? If we feel that we are not, then we choose to follow the worst tradition of European modernity in valuing white western life above brown Muslim life. We choose the opiate of comforting our self-image over the cure of engaging in self-critique. If we truly do not want a repeat of the Paris attacks, we must confront the major and most violent players in the “clash of barbarisms”, the agents most responsible for its genesis and continuing dynamic: our own “rational, post-Enlightenment” states and the racialised narrative which pre-sensitizes us to certain forms of violence while making us cold to the vastly greater suffering inflicted upon others in our name.